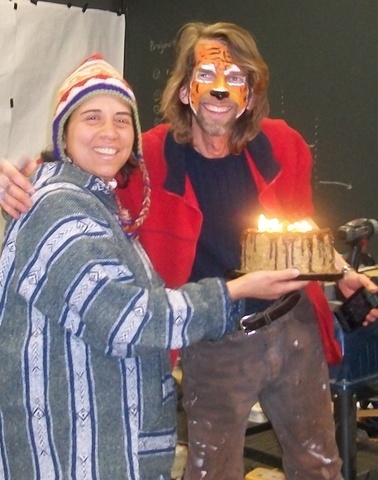 Last night I attended the birthday celebration of an artist friend, Robert Opel. It was held at /serj/ - Books and Local Food. Serj is located at 400 North St. Paul Street in the Hartford Building.The Hartford Building is a mid-rise skyscraper located in the City Center District of downtown Dallas, Texas (USA) and adjacent to DART's St. Paul Station. It was developed by Trammel Crow and Eugene Locke. This building, which cost $5 million to build, opened in 1960. Those who live in areas nearby to the heart of Dallas can jump on the DART and be delivered to the front door of /serj/ in 40 minutes or less. The trip will only cost $2.50--no parking, no driving, no gas--and, on the way back home, you can read a book that you purchased at /serj/. Speaking of the heart of the downtown business area of Dallas, you can think of it also as a small town of approximately 8,000 people because that's about how many people currently call the downtown area "home." Use a little imagination and introduce your friends to a cool unique urban/small town experience by hosting your next party at /serj/. 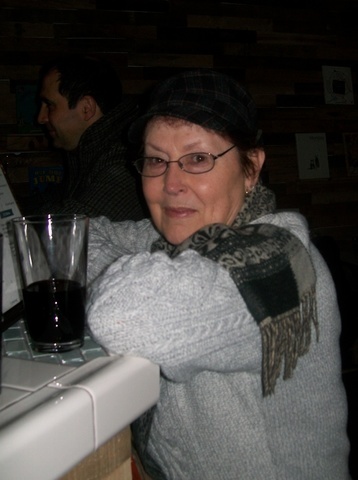 Anita and Robert Opel at /Serg/ - Feb 27, 2015 celebrating Robert's Birthday. It was a surprise party. Anita, Margie and I took the DART train down to /Serg/ last night where we met up with other friends of Robert's. Thus you see Robert in his paint clothes. After work, Robert, an employee of the Dallas Museum of Art, is currently leading the efforts to paint a huge mural of "The School of Athens" on a wall in a large back room at /serj/. A fellow artist had painted Robert's face in celebration of his birthday just before we arrived. This room is intended for poetry readings, musical and other artistic presentations as well as parties. You don't have to wait until the mural is finished to party there. You can come on down there now and watch the artists at work while partaking of some of the wonderful local goodies available from the menu at /serj/. The School of Athens, or Scuola di Atene in Italian, is one of the most famous frescoes by the Italian Renaissance artist Raphael. It was painted between 1509 and 1511 as a part of Raphael's commission to decorate with frescoes the rooms now known as the Stanze di Raffaello, in the Apostolic Palace in the Vatican. Commentators have suggested that nearly every great Greek philosopher can be found in the painting, but determining which are depicted is difficult, since Raphael made no designations outside possible likenesses, and no contemporary documents explain the painting. John and his wife Anne are New York City transplants. /serg/ is their unique contribution to building a loving and friendly downtown urban community. It is indeed a lovely work in progress. Like any good locally held company, /Serj/ owners purchase as much of their supplies and goods as possible from local producers. Their menu features all-natural drinks, food and treats from local companies. Most items are available for delivery locally, cookies are available for mail-order worldwide. Their coffee comes from Noble Coyote Coffee- Dallas, hot chocolate & Chai tea from Sterling Tea in Rockwall; Milk used for all their coffee drinks from Mill-King, Waco; Soup from The Dallas Soup Company; and grass-fed beef from Hudspedth Farms in Forestburg, TX; Ice-Cream from Henry's in Plano. They rotate the entire catalog of Henry's flavors throughout the year, with fun seasonal flavors and exclusive combinations made just for /serj/. Cookies from Cookie Magic in Dallas: All-natural, hand made, from scratch daily. These AA Texas Sweet Cream Butter cookies are incredible. Try the New York Pretzal Cookie for a whole new spin on things. Water from Aerobic Water in Greenville, TX We use this wonderful water in everything we serve, including the coffee and tea. Available by the glass, in a re-fillable glass jug or in 5 gallon sizes which are available for local delivery. In addition to their standard menu, John and Anne are masters at locating some of the greatest vegan and vegetarian fares from local caterers and bringing them to the party. For example last night we had wonderful vegan pizza and spring rolls. Wine and other alcohol was served as well. As for their books--well that's another whole story. John and Anne hand pick every single book they carry. Their goal is to take all of the fun books you might find in a trip to a large store and put them in one place. Their focus is on hardcover books that you'd be proud to own or give as a gift. They especially enjoy books on cooking, art, pop-culture, crafts, children's titles and fiction. They price-match the current Amazon price on all titles. 10% of all books sales go to benefit LIFT, a local organization dedicated to adult literacy. Learn more at www.lift-texas.org. To learn more about this great local place in the heart of the downtown Dallas business district, visit their website at serj books, but remember serj is much more than a book store, it is the extension of the living rooms of the people who live in downtown Dallas AND, in case you don't live in the downtown Dallas area, please remember that you are invited to board the DART and be delivered to their front door--day or night. 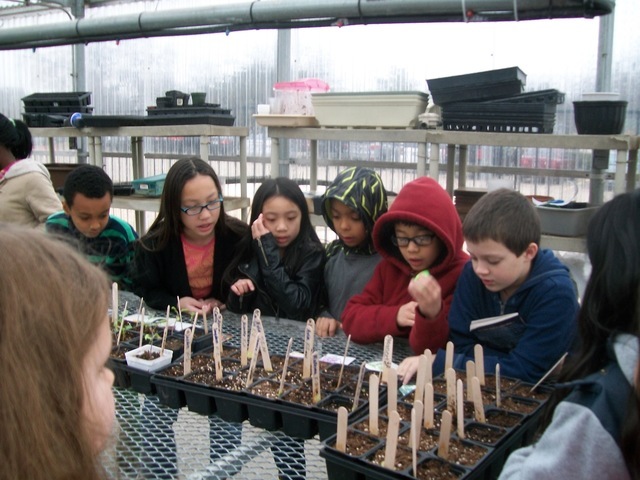 A few of the 54 Beaver Technology Center students from the URBAN GARDENS FOR KIDS botany elective Feb 27, 2015. As part of the support network for our community, members of Loving Garland Green (stewards of the Garland Community Garden) interact with the youth of our community in various ways--from advertising and attending their various fund-raising events to participating in educational events related to gardening. For example, we have designed an 8 week course for elementary students at the Beaver Technology Center, a magnet school located here in Garland. When the course is completed in April, we will make all the course materials available on our website at Loving Garland Green and free to the public. Others can use these materials to create their own version of Urban Gardens for Kids classes. This course is designed to be taught twice a year: in the spring and in the fall. Community connections often result in positive ripple effects. Our current connections with Beaver Technology Center are an example. Beaver Tech has a very large professional greenhouse, complete with a built-in watering system, fans, and heaters. It is very nice. The only thing bad that could be said about it is that it is currently under-used. That may change this fall. I would like to see two classes of Urban Gardens for Kids held. The first class would begin that last week of August when school usually starts. The children would install a winter garden in the outside garden area as the major project for this class. As part of this class, the students would learn how the American pioneers grew food in the winter as well as the various techniques such as root cellars they used to preserve the food. The second class would begin in mid-October. This one we might name something like "Hothouse Tomatoes for the Holidays". This course would involve growing plants in the greenhouse--from seed to harvest. Just before holiday break in December the students could harvest their vegetables for holiday presents. I would love to see some of the neighbors in the area get involved in this project with the kiddos. It might even be possible to have a summer garden program as the greenhouse also has an outside, fenced area. All of these activities are hovering in the realm of community possibility, just waiting for someone like to step forward to lead them into reality. All of this gardening activity must come with the approval of Mrs. Edith Beaver if she is looking down on us today. Beaver Technology Center, formerly Beaver Elementary, is named after Mrs. Edith Beaver. Mrs. Beaver and her husband, James Beaver, stalwart Garland citizens, farmed the land where the school stands. Yes, the very spot where the children and I planted seeds in a greenhouse this morning is on land that was once a farm. In spite of the snow today, we are moving forward, with our plans for developing the Children's Garden. One of the themes that we hope to demonstrate at our garden is affordability of gardening. If you've priced large pots lately, you know they can be expensive. Among our less expensive suggestions for containers include used feed sacks--particularly those made of plastic sheeting. The example of the sack with the deer's head above was secured at Roaches Feed and Seed and cost a whooping 10 cents. The beautiful rooster on the left we obtained from a local alpaca farmer for 50 cents. 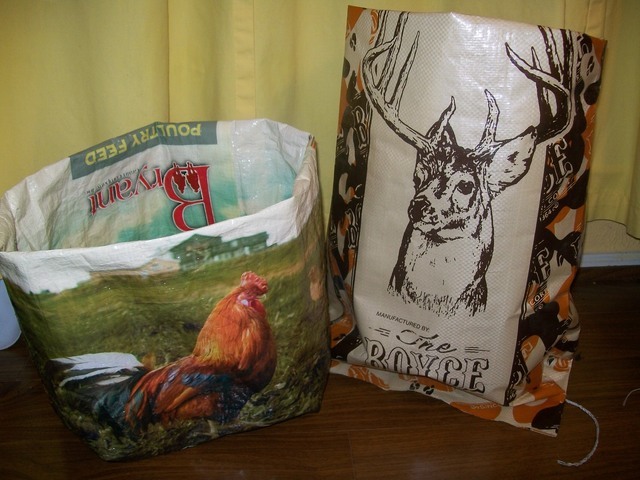 In the Deer's head bag we are planting potatoes and the rooster bag is destined to house carrots and beets. We have six of these bags that we will feature on the wooden pallets in front of our Children's Garden. A butterfly garden will be installed in the spring and we will be sure to include literature to educate visitors regarding this special space. 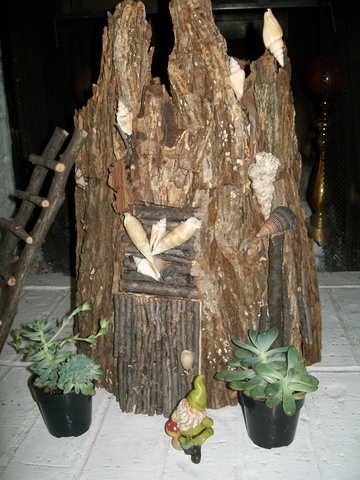 And then there are the fairy houses. . .We will have fairy houses and tiny fairy gardens within the Children's Garden area. Below is one featured that is made from bark. It will be suitable for placing outside. Speaking of houses, one of our members, Colby Clark, has built and erected a blue bird house near the Children's Garden. The citizens of Garland are working hard in concert with our community leaders to explore all the possibilities that urban agriculture can bring to our community. Some citizens such as Melyssa Childs-Wiley, Director of Fat Lady Foods, LLC shown above are already realizing the dream of earning their livelihood on the shovels of local urban agriculture. Melyssa's company is now three years old. 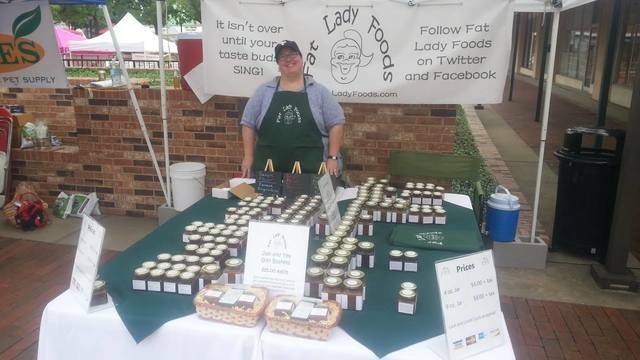 Fat Lady Foods is a perfect example of how urban agriculture can be a boon to a local economy. The fruits she uses for her jams and jellies she purchases from local farmers--many of them local urban farmers who grow fruits and berries in their own yards. 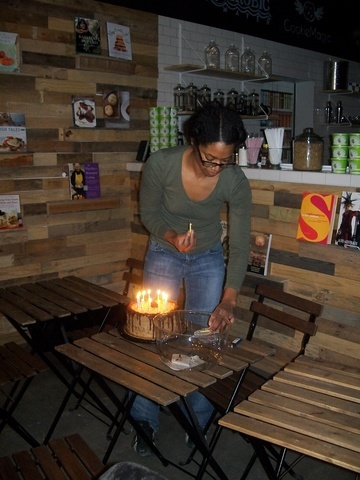 In addition, she uses a local commercial kitchen to cook up her product. Most of the dollars used to create, distribute and purchase these products stay to be recirculated in the local economy. The Garland Community Garden, stewarded by Loving Garland Green, is at the forefront in our community when it comes to promoting urban agriculture as a way for individuals and families to supplement their incomes and to stretch that tight dollar bill. As Rosiland Creasy (an organic gardener from California) demonstrated in 2008, a family can stretch their food budget by $700 a year with a small 100 square foot garden. Others tell us they add as much as $25,000 a year to their family budgets--just by selling seedlings from their driveway. Although the Garland Community Garden has yet to realize its first birthday, we were still able to illustrate the potential dollars and "sense" of urban agriculture last year. For example, we illustrated there is money to be made from growing and selling loofahs in our community. We raised about 24 of them out of one five gallon bucket. Half of them were distributed among members and the other half were sold at the Garland Marketplace at $2 each for a total of $24--proof of concept for the loofah market here in Garland. I kept track of the blackberries I grew and harvested in my yard. At the end of June, according to local market value for these berries, I would have earned $175 from the sale these berries. 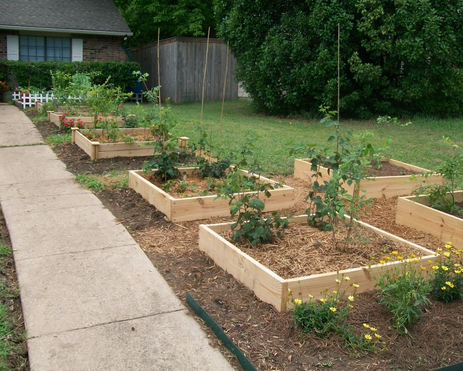 There are four bushes that are planted two to a four by four foot raised bed. In other words, 32 square feet was all that was required to grow the blackberries. Grapes that I grew in only 16 square feet yielded a crop with a market value of $65. This year we have many experiments happening down at the garden. We hope that you will stop in and visit and be inspired to join us. For example, we have expanded our loofah project. This year we are constructing a loofah tunnel--sixteen feet long, four feet wide and five feet tall. There will be a butterfly garden, a Children's Garden, a medieval herb garden, a Three Sisters Garden, an old fashioned watermelon patch and many edibles that perhaps you never heard of such as "bitter melon" that come to us from our immigrant community members. Our community has many citizens and groups who are working hard to bring back pieces of our great Blackland Prairie--many of whom are our own city employees. This vast prairie once stretched from the Red River on the north southwesterly to San Antonio. Today, its is estimated that less than 1% of the vast prairie land remains. Garland is a metropolitan area in Dallas county where you can see not only one, but two examples of what this area looked liked over 100 years ago. In tribute to Garland Parks and Recreation Department as well as to the citizens who belong to a group called the Preservation Society for Spring Creek Forest, we at Loving Garland Green (stewards of the Garland Community Garden) are promoting their work by planting a small plot demonstrating the plants that were found in our almost completely destroyed original ecosystem. Also at our small example we will provide signage directing our visitors to seek out these other locations in Garland where they can see a wider expanse of what was once our great prairie. In case you don't want to wait for us to install our bed at the Garland Community Garden (which likely won't be ready for demonstration until the end of April) these other two address and related information are provided below. 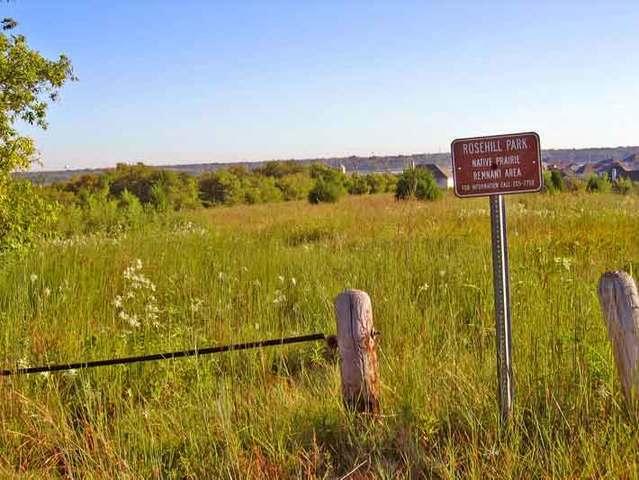 This 75 acre prairie is located north of Country Club Road across from Lyle Middle School in Garland.There is a good diversity of native grasses and forbs, including Indian Grass, Big Bluestem, Little Bluestem, Eastern Gama, Side-oats Grama, and Threeawn. And there is a group (Preservation Society for Spring Creek Forest) that supports these efforts. You might be advised to call to receive more information on Preservation Society membership and Spring Creek Forest --972-205-2750. Honoring Our Blackland Prairie--How far should we go? 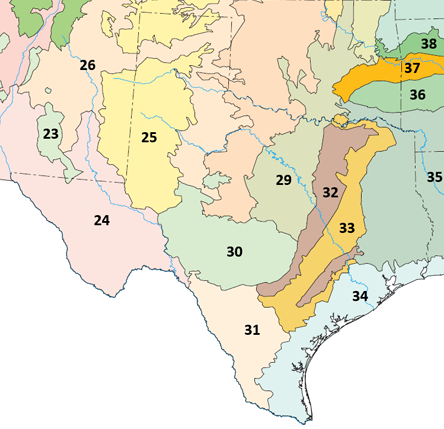 "Texas ecoregions" by Level_III_ecoregions,_United_States.png: U.S. Environmental Protection Agencyderivative work: Hike395 (talk) - Level_III_ecoregions,_United_States. The eco-region Garland and much of the DFW area is included is an eco-region known as the "Blackland Prairie. This area begins on the north from the Red River and extends southwesterly down to San Antonio. The Texas Blackland Prairie is the most endangered ecosystem in the USA. Agriculture and urbanization have left less than 1 percent of this once vast prairie that covered almost 20,000 square miles. Loving Garland Green has two small projects under consideration for Spring of 2015 to honor this ecosystem: 1) Building a patch of Texas Blackland Prairie and 2) Growing a lawn of Buffalo Grass. There are many reasons why we should protect and restore our prairie. Protecting water quality and quantity: Native grasslands protect the watersheds in which they occur, increase water infiltration and water yield, increase water supply by reducing erosion and reservoir sedimentation, and increase water quality due to the lack of fertilizer, pesticide, and herbicide use. Protecting declining grassland birds, native pollinators, and other wildlife by protecting and restoring their habitat: In addition to the native plant communities of the tallgrass prairies, conservation of tallgrass prairie is needed as habitat for wildlife such as grassland birds and native pollinators. Grassland birds are experiencing the greatest declines of all bird groups, and to save the grassland birds we need to protect and restore their habitat: prairie. Protecting beautiful native Texas prairie plants and critically imperiled native plant communities: The main plant communities of Texas tallgrass prairies are highly threatened. These native plant communities include native plants such as Little Bluestem, Big Bluestem, Eastern Gamagrass, Brown-seed Paspulum, and Yellow Indiangrass, and are ranked with a Global Conservation Status of G1 - Critically Imperiled to G2 - Imperiled, the most threatened conservation rankings. Acting as local seed sources and models for prairie restoration and biofuel native prairie plantings: The location and protection of prairie remnants is also needed for restoration of land to return it to prairie so the amount of prairie habitat can be increased (both new restorations and restoring land around existing prairie remnants to increase the size of the remnant prairies). What can we do to restore our native Blackland Prairie area within the boundaries of that 57 square mile area we call Garland? And/or should we? And where would we begin? Can a prairie co-exist within an urban area? Can a Blackland Prairie share an area with a community vegetable garden? This is a project that has captured not only my imagination, but also my heart. Perhaps we should at least study the potential value of an undertaking to establish small Blackland Prairie plots throughout our city. Most definitely it would be a collaborative project involving the wisdom of numerous groups such as the Native Prairies Association of Texas, Texas AgriLife, Texas Parks and Wildlife, and of course members of our own city government and Parks and Recreation Department. Another critical consideration regarding the development of Blackland Prairie patches within an existing urban area is, of course, the issue of fire. The threat of fire could be managed by continuous stewardship and keeping the size of the prairie plots to less than 1/4 acre and other requirements including perhaps distance from existing buildings and homes, etc. We are fortunate to have one example of a larger area somewhat near us. Cedar Hill State Park, located near Dallas. Approximately 60 acres in four tracts are preserved as hay meadows. 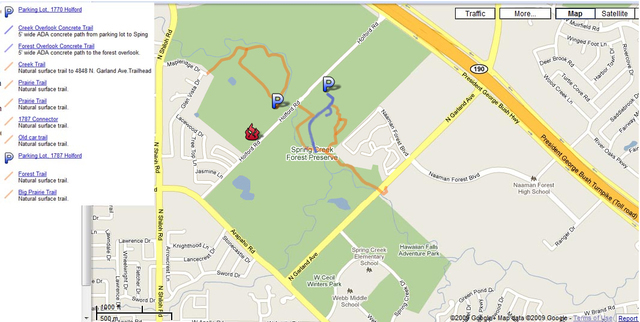 Primarily, the areas are big bluestem-Indiangrass communities with abundant forbs. At the moment, I can easily see how a small Blackland Prairie could be established down at 4022 Naaman School Road. It would begin at the bridge and extend over the front of the property all the way to the driveway into the property. At some point in time the city has plans to build a walking path along Naaman School Road, a footbridge and a pervious parking lot in this front area. The parking lot is not large, as I understand the plans, and would only cut into about 1/4 of this prairie if it were established. What should we do with Texas Invasives? Should we repair the damage that has been done and restore the natural ecological balance of our land, or should we allow these invasives to have their way with our native plants? This is a side question that is intertwined with the establishment of Blackland Prairie plots because in part, the successful re-establishment of some of our prairie will likely involve curbing the growth of non-native invasives. Loving Garland Green members are not the appointed stewards of the riparian area that extends from the border of our licensed community garden area down to the creek. Therefore we will do nothing to the plants in this area. However, it is interesting to note that at least one of the more abundant trees in this area, the China Berry, is labeled as a "Texas Invasive." This area was once a residential area which probably explains the abundance of this tree. 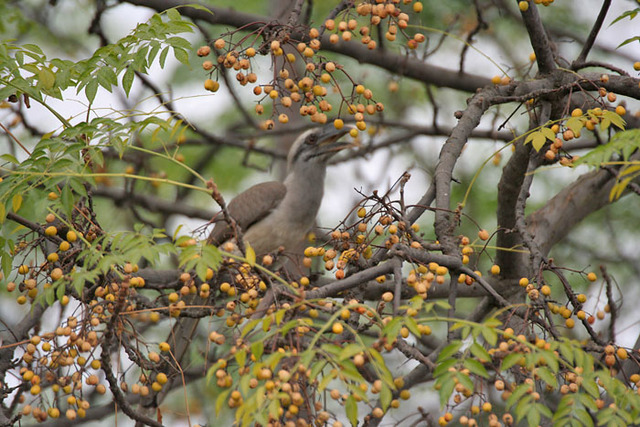 The Chinaberry was once popular to plant as a shade tree because it grows so fast. The Chinaberry outcompetes native vegetation due to its high relative resistance to insects and pathogens. Its leaf litter raises soil pH, thus altering soil conditions for native plants and seed germination. Chinaberry is a very fast growing tree that reaches 18 - 24 feet in height in 4 - 5 years. May reach 50 - 60 feet in total height. Although I"m not certain, I suspect the bamboo grove down there is also a non-native Phyllostachys Aurea (golden bamboo) that someone living in that area once planted years ago in their backyard. If so, it is branded as a Texas Invasive and as an ecological threat: Infestations of bamboo displace native vegetation, alter habitat, and upset food chains. For streams, bamboo leaf litter alters stream food webs starting with litter-feeding stream invertebrates. It is also known to attract roaches and rats in urban areas. It's interesting and happy to note that butterfly gardens which are increasing in popularity in our area happen to contain many of the wildflowers that were once found in our Texas Blackland Prairie. They don't, however, include the native grasses once found in the prairie. If you are interested in creating a small garden plot of Blackland Prairie in your own yard, one of the best sources for information, seeds and plants is Native American Seed. To learn more about Texas Invasives and their impact on the native plants in our state, check out Texas Invasives. Their huge database includes invasive plants and animals. Nothing like Cabin Fever for Inspirations, or is that Deliriums? Where is that fine line exactly? Among other things today, including updating Loving Garland Green's Website, and adding a couple of cool videos to our home page, I wrote a project plan to submit for approval to Loving Garland Green members at our next meeting March 2--which by the way, you are invited to attend. It's my home at 216 East Kingsbridge Drive Garland Texas 75040 Mondays (expect for tonight Feb 23) from 6:30 to 7:30 PM. PURPOSE OF THIS PATCH OF GRASS: to educate the public on the value of replacing their lawns with a native grass by showing them how nice it looks and how little care and water are required. Being green is a lot easier and sometimes cheaper than we realize. We will also have a sign and information regarding the project. Buffalo Grass appears to be a great alternative as it creates a sod, much like St. Augustine or Bermuda. But, unlike St. Augustine or Bermuda, Buffalo Grass only needs 12 inches of water a year, does not respond to fertilizers AND does not have to be mowed since it get no taller than four or five inches. Location in the Garland Community Garden: Space beside the Iris bed in front of the Children’s Garden (about a 20 x 20 foot patch). This one will be easy because, other than pulling up the grass/weeds growing there now, we will not have to prepare the soil in any way. 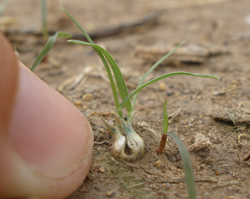 We will just sow the seeds and keep it moist until the native grass is established—provided all the claims for this grass are true including that it grows in unamended clay soil. That all remains to be seen and we make no promises. The total cost for this project is only about $40 (not counting labor of members of course). We plan to order the seeds from Native American Seed. The cost is for seeds and related signage. We might also expand the possibilities for planting native grasses by planting samples of other types of grasses in pots. Would you like to donate? Attend one of our meeting and bring your checkbook with you! If you are interesting in seeing local GARLAND TEXAS on EBay, select the link above. We support all things legal local. Let's Plant a Weed Garden! Following the lead of Shakespeare's Hamlet who said: " for there is nothing either good or bad, but thinking makes it so," I wonder if perhaps the Garland Community Garden needs a weed garden added to our plots down at 4022 Naaman School Road to help promote Hamlet's noble concept. Our spring 2015 plans include the additions of a medieval spiral herb garden, a Medicine Wheel Garden in tribute to the Amerian Indians, a prairie grass plot in tribute to our lost prairies, and a butterfly garden for the pollinators. Perhaps we do need to add a weed garden to this list. Of course we would not have just any weed in our weed garden. 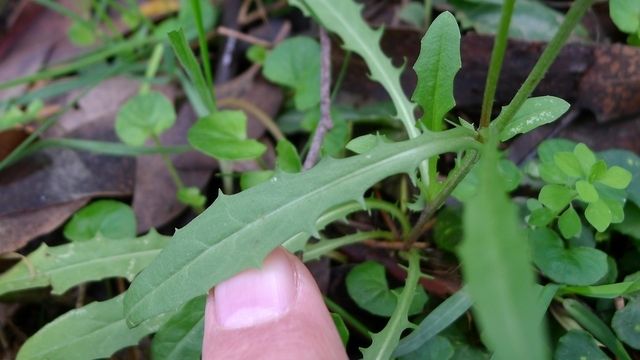 Only weeds that are edible would be included, and that list is much longer than a lot of folks might think. In the Garden of Edible Weeds. . . Most of us know today that dandelions are edible and the younger the leaves, the more tender and less bitter. But, between you and me: I would not eat a dandelion from most lawns because of all the chemicals that most lawns are doused with--from Roundup to fertilizers to pre-emergents and various other herbicides and pesticides. Chickweed grows close to the ground with lush little leaves that you can put in your salads or eat right on the spot. It is very nutritious and some say is very good for the lungs. Some chop up the leaves and make a salve with it to treat various types of rashes. Look closely at the chickweed flower. It looks like it has ten petals, but it actually only has five. Each one of the five petals are split into two. Every part of this plant is edible. 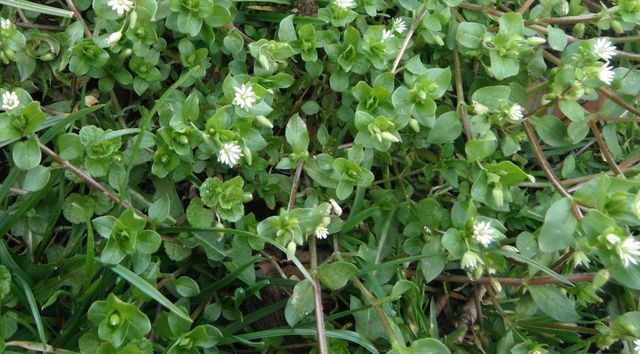 The chickweed in our area is grows in the winter and early spring. You can often find it growing along building foundations. Be forewarned, however, the Texas Invasives Database lists Chickweed as an ecological threat. Perhaps we won't have this one in our garden after all. But then again if we are careful--particularly when it goes to seed--perhaps we might. Common Purslane (Also known as "pigweed" and "little hogweed"
Purslane grows everywhere. It loves the heat and doesn't need much water. It even grows up between the cracks in the sidewalk. I've eaten it before and it tastes to me a little like green beans with a little bit of lemon. It is reported to have one of the highest sources for omega 3 fatty acids of any plant. Purslane grows flat against the ground. and spreads out from one main root in a radial fashion. Its small yellow flowers are only open in the morning. WARNING: There is a plant similar in appearance to Purslane. It is called "Spurge". Although it looks very similar to Purslane, you can quickly tell the difference. Break the stem. If a milky substance comes out, don't eat it because that's a Spurge. 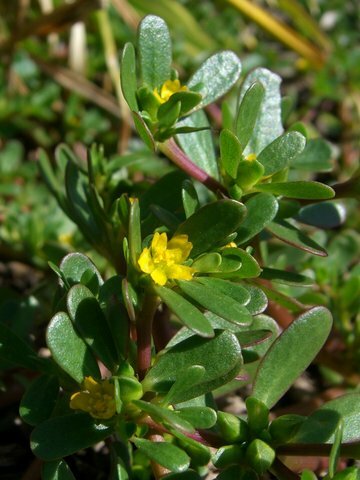 If you break the stem of a Purslane, there is no milky substance. 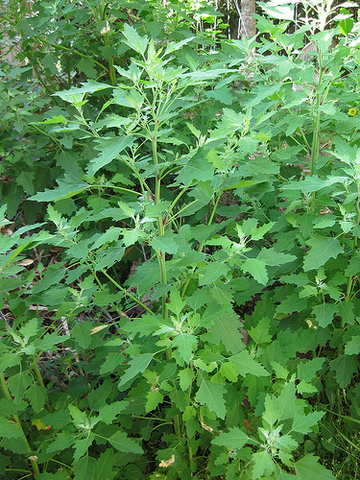 Photo from Merriweather's Foraging Texas--Visit site to see more photos of this weed. HMMM Pig weed seems to be a popular name for these edible weeds. I have not tried this one yet, but I look forward to the experience. Be sure to look at the Foraging Texas site. Merriweather has some great photographs of Lamb's Quarters. I"ve seen this "weed" many times--in fact I've pulled it up more than once. Next time I see it, I'll take bite. It grows from early spring through early fall so there is lots of opportunity. Some recommend cooking this leaf as it contains oxylic acid. However the jury is still out on that one. More on this topic. Regardless we will have at least one weed that we cultivate down at the Garland Community Garden this season and that's Pokeweed. I'm counting on Charlie to bring one down in a pot as I'm sure his yard will once again produce plenty of them. Pokeweed is such a famous weed that in 1970 Tony Joe White wrote a song titled Polk Salad Annie. 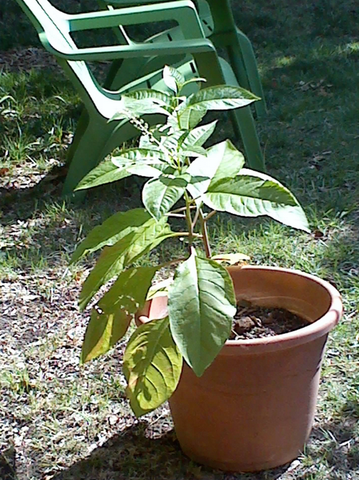 "Young pokeweed leaves boiled three times to reduce the toxin, discarding the water after each boiling, results in "poke salit" or "poke salad" or "poke sallet" and is occasionally available commercially. Many authorities advise against eating pokeweed even after thrice boiling, as traces of the toxin may still remain. All agree pokeweed should never be eaten uncooked. 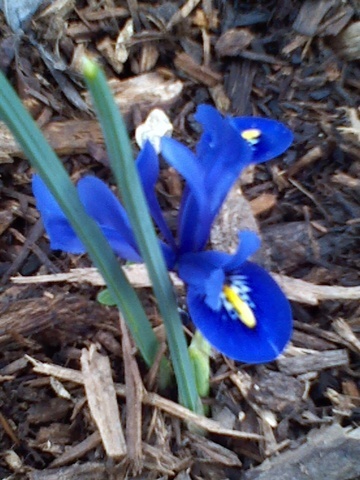 Little Iris bravely peeking out in the Garland Community Garden--just before a cold snap. I almost don't want to brag on leaves in the fear that more people will start waking up and keeping their leaves for themselves instead of bringing them down to the garden but I just can't help myself. Leaves are so wonderful that I want everyone to hear about them. On Sunday I dumped three bags of leaves around the children's garden where I have planted wildflower seeds. The mulch of leaves will protect the little seedlings that are already sprouting up. It's a lot easier and much less expensive method to protect tender plants with leaves. When the weather warms up, the leaves can be brushed off the top of the plants, but still left as mulch to protect the soil and eventually, through the process of decomposition, to enrich the soil for new plants that will follow. As for bringing leaves down to the Garland Community Garden--you can consider it wide open season. Bring them on. We plan to line the walkways between all our beds with them. Over time, the soil at 4022 Naaman School Road will evolve into the richest soil in our community. It's the preferred method of nature. If you want to see how it will look, you can visit the garden and look at the layer of leaves on part of the pathway at the back of the Winding Garden area. It looks like the yellow brick road--very pretty. As time moves on, the leaves will darken and our pathways will look much like a forest floor. We won't have weeds encroaching on the garden this year. When a weed crops up, or as the leaves decompose, we'll just put a little pile of leaves over it and stomp it down. At last we have a final solution for Garland residents who care enough to not send their bags of leave to the landfill--which is where the majority of them end up. The Garland Community Garden can now handle all the leaves you send our way and ensure they do not go to the dump. The leaves decompose over time. As with wood mulch, the path is not muddy after a rain. It is much like a natural forest floor. Then, after a year or so, gardeners at the Garland Community Garden can dig up parts of the pathway and use it for compost for the garden beds (filling in the hole afterward with more leaves). This seems to be the trend in organic gardening—moving away from composting in bins and instead composting right near where you will be using the compost. In fact, in many cases we are bringing the compost process right to the bed. This saves the back-breaking work of turning and then hauling the compost to the beds. We are moving toward the method of the no work style of Ruth Stout—the mulch queen. The chicken wire baskets that you can see in many of our beds demonstrates a "compost right in the bed method". These baskets are designed to throw the veggie scraps right into the basket and then place some wet crumpled newspaper or leaves on top to discourage flies and mask any odors that might otherwise attract pests. This method also helps to conserve water as the roots of the plants go for the baskets where they draw nutrients and moisture from the decaying veggies. Trench composting is another permaculture method of composting right in the bed. For this type of composting dig a trench about 8 to 12 inches deep down the middle of the bed, fill it with a few layers veggies and leaves. Cover it, and voila—another compost bin directly in your bed. It is hoped that we can work out a program to obtain scraps from a local grocer to keep us supplied as green vegetable matter speed up the decomposition process. Contrary to common belief, there is no city ordinance against grocers giving away their spoiled vegetable matter to private citizens in Garland. There is still a place for compost bins in the garden--not only the home garden, but the Garland Community Garden too. Covered bins are fairly essential in my opinion, for hot composting which is absolutely necessary if you want to ensure that any and all weed seeds as well as pathogens from manure are rendered inert. On Friday, after my URBAN GARDENS FOR KIDS class, I stopped by the Garland Environmental Waste center on Commerce to pick up some great educational material on composting from Glenna Brown (who sadly for us will be retiring the end of this month). Glenna also gave me two open compost bins--one for each of the URBAN GARDENS FOR KIDS classes that I teach at Beaver Tech. Thanks to Glenna, city employees of the Garland Environmental Waste Department this week will deliver three retired green garbage bins with the lids to the garden. We may even beautify these bins with paint before spring officially arrives. Go down to the Garden and visit. Even at the end of winter, it is looking good. Thinking about all the people in my life tonight and feeling gratitude. love and appreciation for all of them. It's good to remember that love is available to us all 24/7--not just once a year when all the retail stores announce that it's "love day." I had a funny moment today. Earlier I had been sitting on my pity pot contemplating the fact that I would not get a valentine card today from a special person. Then when I was waiting for a cashier to print out a lottery ticket for me, I saw a stack of valentine cards by the cash register. There were 8 of them. While the cashier was printing out a quick pick for me, I read all 8. They were corny and sappy as they should be, but each one was fun to read. The experience inspired me. Regardless my circumstances next year on Valentines Day, I think I'll go to Hallmark and read every one of their Valentine Cards. So what else on this love day? I "loved" the Garland Community Garden by adding mulch to the children's garden. I had a lovely dinner with my friends Gene and Margie. And I just about completed my Fairy Garden for the Bud and Blossom Club. As usual, the concept in my mind is never quite the same as what I execute, but still it was fun. I only have two things left to do: 1) Finish the double doors and 2) Build the outside ladder to the garden. Tomorrow I'll try to bend Margie's leg into taking bark that I have and constructing a Fairy Garden that can withstand the weather in a garden. Unfortunately, mine will not. However I have an excellent resting spot planned for it. I'll donate it to the kiddos in my URBAN GARDENS FOR KIDS class at Beaver Magnet school. 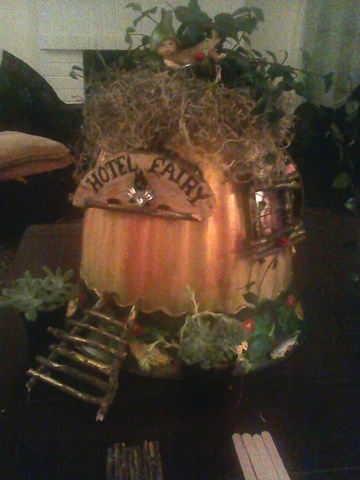 HOTEL FAIRY View 1: I still lack putting on the double doors and the ladder that will go up to the garden. 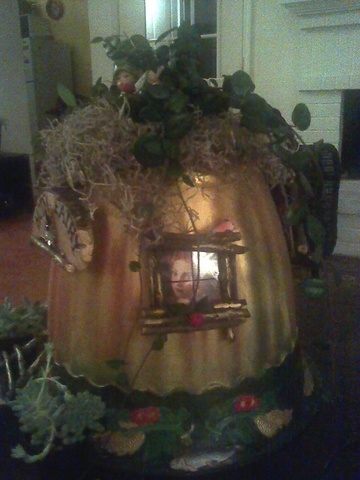 This is an old garden pot that I gilded with fairy gold and painted a border around its edge. FAIRY HOTEL View 2. The hotel has three views featuring fairies looking out. A complete butterfly/hummingbird flower garden in a box waits for warmer weather in my home near the fairy hotel I'm building. We may have a butterfly garden at the Garland Community Garden in 2015. Loving Garland Green members are all about promoting sustainability, encouraging our residents to grow at least some of the food they eat, and demonstrating how we accomplish these feats as ordinary citizens down at the Garland Community Garden. Much of what we do down at the garden is an experiment which has sprung up from ideas contributed by members. And that's all part of the fun of learning together. Will the trampoline converted into a self-standing rainwater catchment system be practical? We don't know yet but we are building it now in Gene and Margies backyard. Based on our current rainfall and its surface area, we are estimating that it is possible to capture up to 72 gallons of water per 1/2 inch rain. If it does appear to be feasible, we will move it to a location in the garden and design a pretty way to disguise it--perhaps with Indiangrass planted around its perimeter. The Indian Grass is also a food host for some larval stages of butterflies and we can always use more of these pollinators. On a serendipitous whim in keeping with our profile of "almost anything is worth trying once", yesterday when I was in a chain store looking for some cheap supplies for a fairy hotel I'm building, I wandered over to their lawn and garden section. Low and behold, I saw a complete butterfly garden in a box. Now I know the serious gardener would mock such a product, but a less experienced, ordinary clodhopper like me looks at it and asks: "I wonder if that works? I wonder if I planted it if the seeds would even germinate?" Well, the ending to this story is that I bought it and brought it home. There is a spot near our Children's Garden that will be perfect for it. I'll follow the instructions on the box and we'll see what happens. 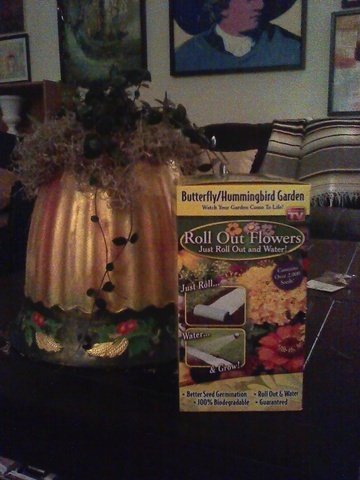 According to the claims on the outside of the box: "Butterfly/Hummingbird Garden - Watch Your Garden Come to Life. Roll out the Flowers. Just roll, water and grow. Over 2,000 seeds and 10 feet long. Guaranteed [I assume guaranteed to grow.]" We may of course also plant a butterfly garden next year that includes more serious research and education regarding types of butterflies we want to attract and their corresponding needs for nectar and host plants. Additionally we would note in these plans at what points in the season we might expect the various stages in the life cycle of the butterfly to appear in our garden so the kiddos (and adults too) could check them out. My front lawn June 28, 2013--Two weeks after replacing most of my front lawn with raised beds. Now, I'm actually thinking about replacing the mulch around the outside of my beds with grass. Yes, grass. After two years now of having to replenish the mulch about every four months, I'm done with that expensive and back breaking chore. Buffalograss is what I'll plant--if I decide to do it. Buffalograss is a 5-8 inch short, sod-forming grass. It lives on as little as 12 inches of water per year, spreading by seed and surface runners. It has no natural diseases or pests, does not respond to fertilizer, and withstands extreme hear or cold. It can be found from Minnesota and Montana down to Mexico, thriving in all types of soils. Indeed, it is an environmentally responsible alternative to Bermuda or St. Augustine. No, I won't be mowing it either--another waste of time, not to mention, pollution. According to the U.S. Environmental Protection Agency (EPA), lawnmowers are worse than cars. A new gas powered lawn mower produces as much volatile organic compounds and nitrogen oxides emissions in one hour of operation as 11 new cars each being driven for one hour. Each weekend, about 54 million Americans mow their lawns, using 800 million gallons of gas per year and producing tons of air pollutants. Garden equipment engines produce up to 5% of the nation's air pollution and a good deal more in metropolitan areas such as our DFW area. Buffalo grass is not the only grass I'm considering. Among the seedlings I've started this year for Loving Garland Green's Seedling Sale in April include about 50 Inland Sea Oats plants. This grass is a shade-loving almost evergreen perennial grass with wide lealves. It is an excellent ornamental grass with distinct chevron seedheads. It's often found thriving in woodland areas which makes it a perfect choice for my back yard which is almost total shade. 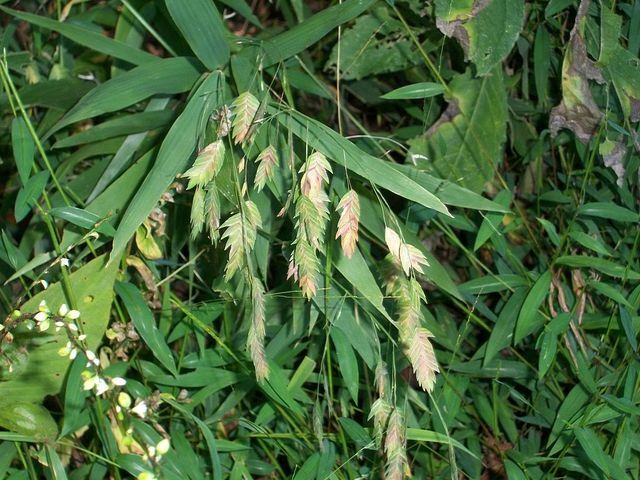 Inland Sea Oats is one of the few native grasses that grow well in moist and shady areas. It's also called Wood Oats, Northern Sea Oats and Riveroats. Gradually over the next year we will be adding displays of native grasses down at the garden. A minimum of three displays are planned for 2015: 1) A pot of Sea Oats 2) a pot of Buffalo grass and 3) a pot of Indiangrass which was once a dominant prairie grass. Indiangrass grows 3-4 feet high and puts out dramatic golden plume-like seedheads on 2-foot stalks from September to November. It endures extreme drought and grows best in sand, loam and clay soils of bottomlands and lower slopes of hills in many regions from Canada to Mexico. It is also a larval food source for butterflies. I'm ordering some Waco Indiangrass roots from Native American Seed. Less than 150 years ago, the great North American prairie stretched from Mexico to Canada. During the past five or six generations 99% of the prairie has been consumed by grazing, farming and urbanization. Today, less than .004% of the tall grass prairie remains in Texas, the largest prairie state which leads the nation in number of acres lost to land fragmentation. I hope that we will eventually have twelve large pots filled with Buffalograss, Green Sprangletop, Sand Lovegrass, Sideoats Gramma, Sand Dropseed, Little Bluestem, Big Bluestem, Switchgrass, Eastern Gamagrass, Indiangrass, Prairie Wildrye and Inland Sea Oats. Plant a sustainable lawn that you don't have to mow or fertilize and you'll have more time to enjoy life. Tell your friends who may be putting in a new lawn to sow Buffalograss and then sell their lawnmower. Over the years they will save a lot of money spent on lawnmowers and the power to run them--not to mention the expense of fertilizer and all the time spent sweating behind a lawnmower. Here's a closing thought: Imagine a Homeowners Association that did not allow lawnmowers or the noise pollution of gas leaf blowers--now those would be some rules that made sense from a human health point of view. If you are thinking that your hands are tied because you belong to a Homeowners Association, you might want to read Texas House Bill 645 which was passed by the 78th Legislature in 2003. This law among other things, prevents homeowners' associations from implementing new covenants banning outdoor water conservation measures.